Blogging is such a funny thing, a constant pull between complete anonymity and total exposure. Being more than a bit shy and reserved in my real life persona, I rather enjoy the wall I get to hide behind while I ride on this internet superhighway, so I didn't know what to make of an email I received shortly after posting this Asian turkey burger with Sriracha mayo recipe asking if I'd like to be interviewed for a documentary about Sriracha. A couple of years ago I would have quickly shunned the idea—too much fear and pressure in plopping in front of camera to be a talking head—but right now I'm in a "busting out of my shell" phase, and decided to dive right in, for better or worse. As the interview looms later this afternoon, my head is whirling with mixture of anxiety and tasty tidbits I could impart in my love for Sriracha, which got me thinking of this recipe I had lurking in the back log for Thai beef rolls with sweet chili sauce—featuring a brief cameo by Sriracha, of course. The official start of the Meatwave is slated for May 18 May 26, so start getting your stomaches prepared for the sudden intake of meat that you've so sorely been missing all winter. 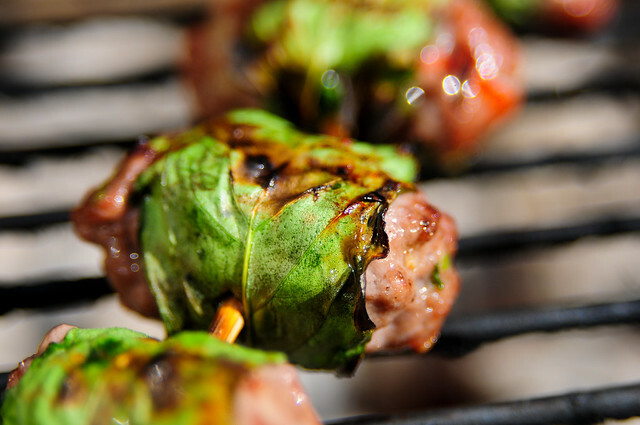 I'm reckoning this blog will also get up and running around that time too, but you don't have to wait that long to get your grilling fix. I'm pleased to direct you to Serious Eats, where the Meatmaster will be doling out his grilling wisdom to the masses. Look for me in the grilling section, but stay and read the entire site. Serious Eats has been the center of my food blog universe since it launched, and if you don't read it already (shame on you), I think you'll also find it the most excellent and comprehensive food blog around these parts. Not even a day old and The Meatwave gets a foodblog nod. 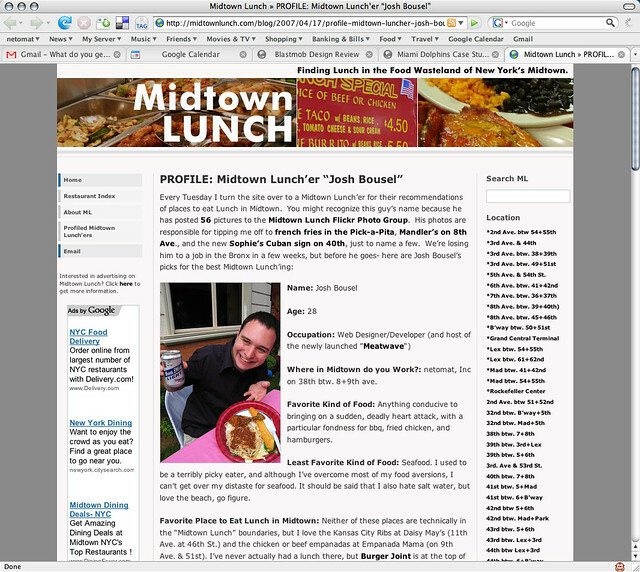 OK, OK...I knew about this in advance (hell, it's me being profiled), and I *might* have rushed this site out early to coincide with a mention on Midtown Lunch, but still, it's exciting none-the-less. Go get reading about The Meatmaster's Midtown eating habits before it gets totally lost in the tubes of the internet.